Hands up who followed me at the start of my blogging career when all I wore were statement necklaces? I hope to god some of you have stuck around...if you have; thank you kindly! Nowadays I hardly wear a necklace and if I do; it's a thin gold chain or a long chain with some kind of geometric shape on the end of it. 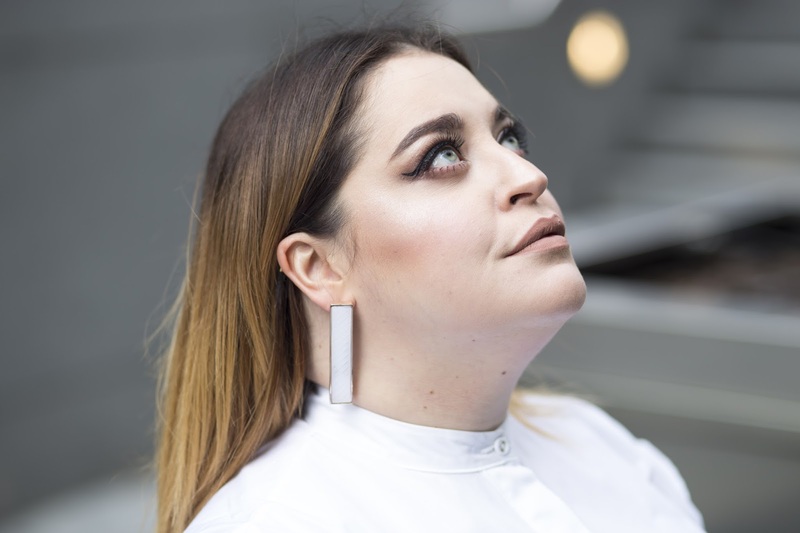 My *thing* over the last few years has been to wear huge chunky, mostly perspex rings and my ultimate faves; a statement earring. When I say statement earring, I don't actually mean an all singing, all dancing chandelier set but more of a modern, eye catching pair. Without realising, my collection of geometric shaped earrings has grown and guess who is happy that geometric jewellery is 'in' at the moment?! Yep, I ammmmmm! Take a look at my geometric earring edit and join the club! I guarantee they will be a conversation starter and you'll wear them for years to come. I absolutely adore your look! I'm very curious about your lipstick - would you mind sharing brand & colour?